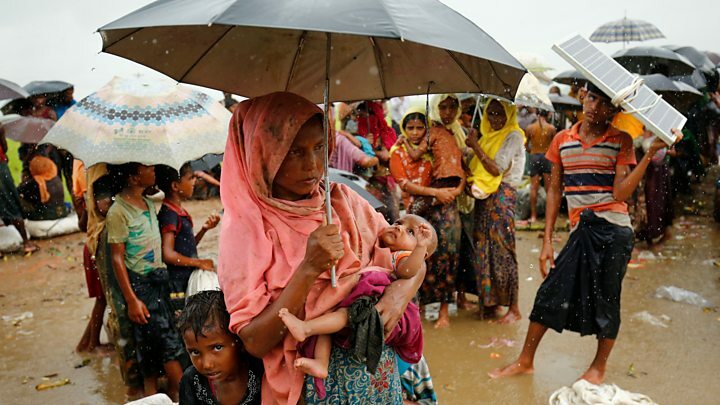 Nearly 40,000 Rohingya Muslims have fled to neighbouring Bangladesh since violence erupted in Myanmar's Rakhine state a week ago, the UN estimates. Mainuddin Khan, police chief of the Teknaf border town, told AFP news agency that the group included a young girl, and said they "had been floating in the river for a while". On Thursday the UN Special Rapporteur on human rights in Myanmar, Yanghee Lee, said the "worsening cycle of violence" in Rakhine was of "grave concern and must be broken urgently". "We are seeing lots of makeshifts tents and shelters on the side of the road - every available space is being occupied," UNHCR regional spokeswoman Vivian Tan told the BBC. On Thursday US Ambassador to the UN Nikki Haley said the security forces had "a responsibility to adhere to international humanitarian law, which includes refraining from attacking innocent civilians and humanitarian workers and ensuring assistance reaches those in need".